As someone who identifies as an Internet unicorn, I love technology. I mean, I don’t love all of it (please lose the algorithms and bring back time-based feeds Instagram and Facebook! ), but I love a lot of the conveniences and innovations afforded, especially when it means reducing visual clutter. For example, it was a big deal when we upgraded our clunky USB-connected printers to sleek, Wi-Fi models. And I am actually the person who resists the bigger phone because I want smaller everything! The 2018 HGTV Smart Home is located in Palmetto Bluff, South Carolina and to the surprise of no one, it is gorgeous. Seriously, big ups to the design and build team and I totally recommend you check out the online tour ; you can even shop some of the picks ! The mere beginning of design gorgeousness! But I digress. I want to talk about some stuff that impressed me about SimpliSafe. Throughout the photos in this post, in the captions I’ll share where you can spot their hardware! And actually, let’s start on that point! 1. SimpliSafe’s hardware is small! Looping back to my initial commentary about loving smaller tech, SimpliSafe was designed in partnership with the global design firm IDEO with the explicit goal of having the hardware disappear into the home; they have managed to reduce the size of their sensors in half, while doubling the range. And it’s funny because when we visited the HGTV Smart Home we started by just walking around and checking things out on our own before the SimpliSafe tour and I completely didn’t notice the SimpliSafe hardware until they started pointing it out! Mission accomplished. 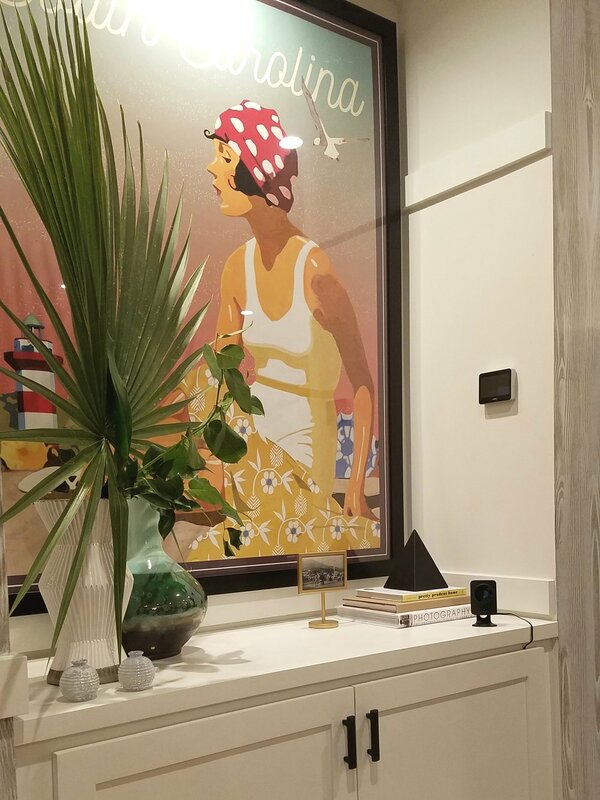 To the right of the door (above the light switch plate) in this gorgeous mudroom is the SimpliSafe keypad. The white device on this console next to the books is the SimpliSafe base station; the SimpliSafe key fob, which allows you to disarm your system before you enter your house, is in front of it. Obviously, cost is often a major deterrent for many people when it comes to thinking about home security. Also, contracts are a major bummer for those who, like me, are commitment-phobes. SimpliSafe offers two different contract-free plans; standard ($14.99/ month) vs. interactive ($24.99/month). And what I found super interesting was this Consumer Reports DIY home security comparison, which includes a helpful graph mapping out hardware costs + the total including 5-years of monitoring. SimpliSafe rates lowest for hardware cost and second lowest including 5-year cost. Also, it’s worth noting that the cost would be even less if you choose less hardware (more on that in a second) or opt for the standard service level (in the Consumer Reports feature, they used the $24.99/month interactive plan in their calculation). Tucked up in the corner near the ceiling is the SimpliSafe motion sensor, which covers an entire room and won't be falsely triggered by pet activity! Choice fatigue is real and one thing I really like about SimpliSafe is that they have pre-bundled hardware kits ranging from $229 to $489 or you can build your own system, where you start with a base station + wireless keypad then add whatever burglary and/or hazard hardware you want. And there are more options coming. Personally, I am most excited about the video doorbell situation because I know that when the doorbell rings and I quietly creep up to the door and peer through the peephole, the person on the other side can probably tell I am there. So despite living in an urban environment, I’m actually generally less concerned about break-ins than I am about other hazards because, 1) we are busy and despite our best efforts to move through the world mindfully, there have been instances where we have accidentally left something on, 2) we live in a side-by-side condo and more humans means more potential for hazards. (This is not me being paranoid; we hear the smoke alarms next door go off with some regularity.) So, I am seriously into fire prevention and water damage hardware...perhaps especially the water damage hardware because when I was pregnant with Violet we had flooding in our basement and no alarm system so we didn’t discover what was happening until we went down to the basement and saw our belongings FLOATING AROUND. And then I had to muck out the basement massively pregnant and there are few things I have ever enjoyed less than that in life. The little black device in the foreground to the right is the SimpliSafe SimpliCam, which let's you see what’s happening at home via the SimpliSafe app. You'll also get alerts when your camera detects motion. Kind of a joke, but kind of not! Their system has been built with backups in mind. For example, twin cellular and Wi-Fi connections run in parallel to ensure monitoring even if your home phone line is disabled or Wi-Fi is downed. Also, the base station is reinforced with a backup battery that engages during power outages to supply continuous power for up to 24 hours. And their hardware includes SmashSafe™ technology to make sure that a home’s alarm signal reaches authorities even if an intruder destroys the base station, siren, or keypad. To the right of the headboard, that little white device mounted to the wall is the SimpliSafe panic button. If you’re at home during an intrusion, press the button to instantly trigger your alarm and dispatch police. In a nutshell, I was really impressed to learn about the design, affordability, flexibility, and power of SimpliSafe. It’s also worth mentioning that the SimpliSafe team members we met were awesome and I always love learning about Boston-based companies doing great things! So if you’ve been considering outfitting your home with burglary and/or hazard hardware, definitely check them out! 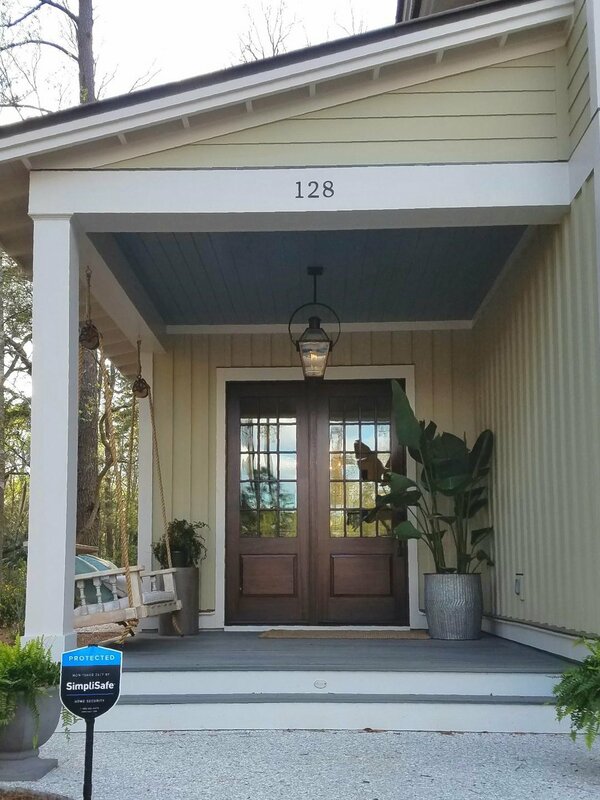 Disclosure: I traveled to the 2018 HGTV Smart Home courtesy of SimpliSafe but all thoughts and opinions about SimpliSafe’s work are, of course, my own. All photos by Christine Koh.